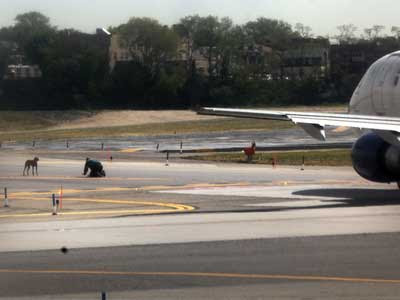 Departures were held up at LaGuardia Airport in New York for 10 minutes yesterday morning while workers rounded up a dog that ran on to a runway. The pooch, a 30-pound Rhodesian Ridgeback puppy named Byrdie, got loose as she was being loaded on to a Delta flight to Memphis, said Port Authority spokesman Ron Marsico. “Byrdie got out of her cage and decided that Runway 31 would be the best place to get some exercise,” Marsico said. Port Authority personnel ran after her, and at one point, Byrdie simply sat down on the runway. Finally, workers got Byrdie’s owner off the plane, and took her to the runway. “Byrdie came right to her,” Marsico said. Planes leaving the airport were held up from about 10:21 a.m. to 10:31 a.m., the Federal Aviation Administration said. Byrdie herself was hardly delayed — her flight took off for Memphis about 20 minutes behind schedule.